I'm so glad that brows are currently having a bit of a renaissance. I've always had an obsession with them & must have spent loads on tools, regrowth products & cosmetics for those two furry lines. Admittedly I've always been into high-end brow products because drugstore brands never seemed to realise that not everyone has really dark warm toned eyebrows. During my teenage goth phase I used to draw on my eyebrows with a black Rimmel eyeliner. It was not a good look, especially when the pencil started to smudge! There just weren't many other options in Boots at the time. Luckily things have improved a bit these days & most brands have cottoned onto the fact that people want groom their brows to perfection. To be totally honest I don't think I'd ever give up my precious Anastasia products in favour of these but it's good to know that more makeup brands are starting to take brows seriously. 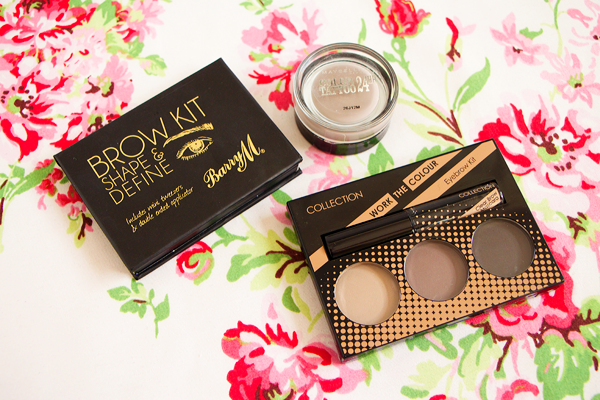 The Barry M Brow Kit comes complete with everything you need to groom & define your eyebrows. 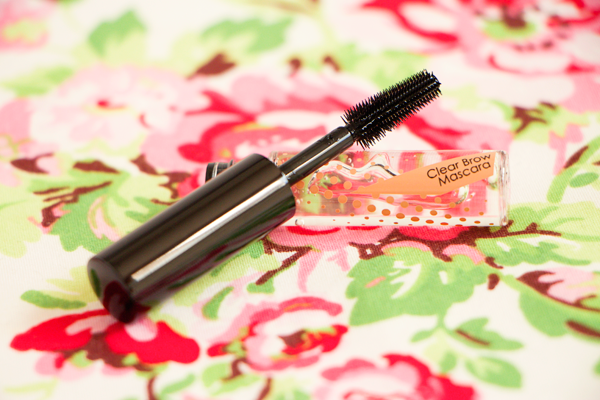 It contains a creamy brown wax, a dark brown powder, a highlighter, tweezers & a double ended applicator. It reminds me of Benefit Brow Zings with the added bonus of a highlight powder. The tweezers are okay for plucking one or two strays but I wouldn't shape your whole eyebrow with them. The brush is surprisingly good. Normally I automatically dismiss brushes in makeup kits but the angled side is perfect for shaping your brows with the tinted wax. After applying the wax you then use the blending brush to build up your brows with the dark powder. Both the wax & powder are very easy to work with. 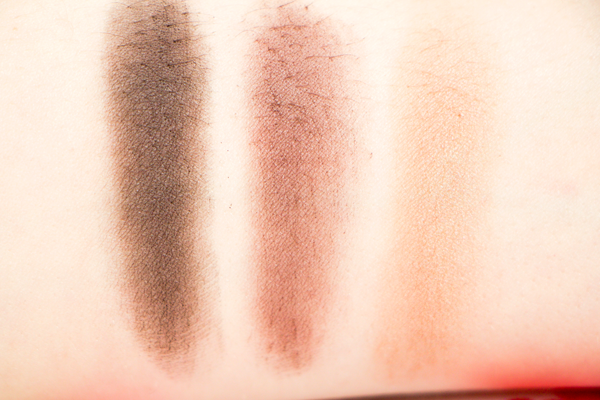 The trouble is this kit only comes in one shade which is horrendously dark & warm toned. I tried using the wax & powder alone as well as together but either way they look horrible on me. 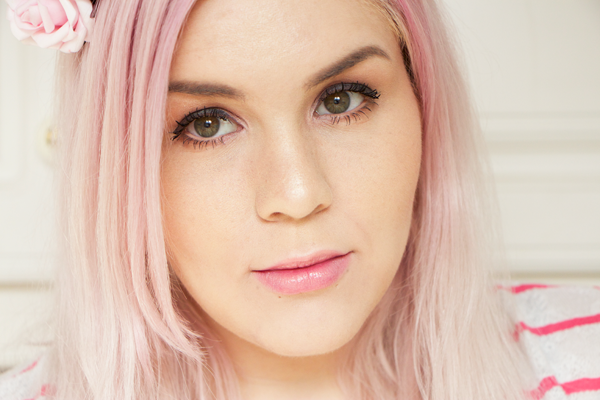 The highlight shade is incredibly subtle & I found it hard to get it show up on my skin. I wish there were a few other colours available as this has the potential to be a truly fantastic kit. Hopefully Barry M will bring out a few more versions soon. I much prefer the Collection Eyebrow Kit. Instead of a wax & a highlight, it comes with three brow powders. 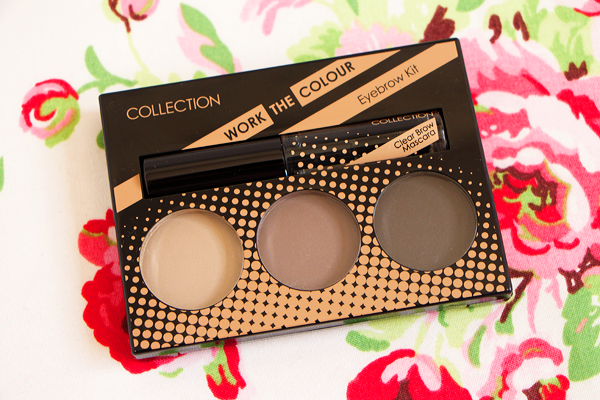 Used alone none of the colours suit me but they can easily be mixed & matched to create your own custom brow shade. 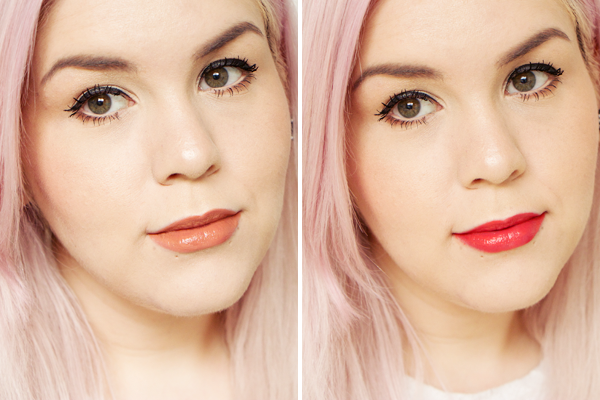 The colours lean slightly warm but they're nowhere near as red toned as the Barry M colours. 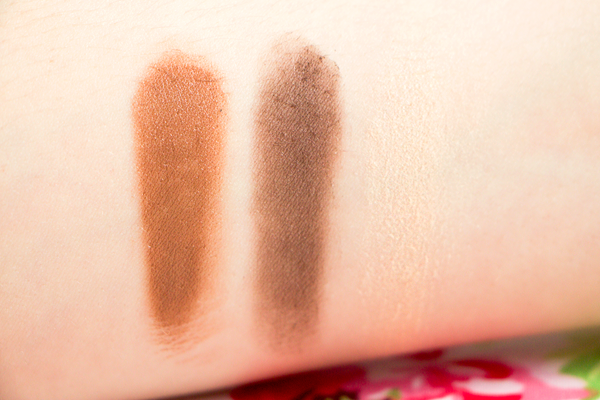 The dark brown powder is extremely dark but the texture is creamy with absolutely no fallout. It's easy to achieve whatever eyebrow shape you desire with this kit as the formula of the powders is really lovely. I find that a mix of the light brown with a little bit of the medium brown shade works well for me. 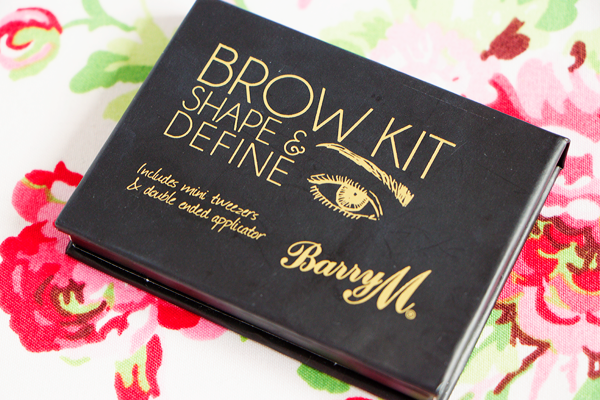 The angled brush is exactly the same as the one in the Barry M kit & applies the powders well. I love that the kit comes with it's own mini brow gel. The formula isn't the best at keeping stray hairs in place but the plastic brush helps to neaten up your brows by pushing everything in the right direction. It also includes a fab little mirror which is the exactly the right size for doing your brows. If you've ever wanted to try the Anastasia DipBrow Pomades but don't want to shell out £15 when you have no idea which colour to get, then give the Maybelline Color Tattoo 24hr Cream Eyeshadow in Permanent Taupe a go. Everyone went mental for these last year so chances are you probably already have this in your stash. Not only is it a wonderful cream eyeshadow but applied with an angled brush it's a decent drugstore dupe for Anastasia Beverly Hills' most innovative product. The formula isn't quite as creamy or natural looking so a very light hand is needed here but otherwise it works in a fairly similar way. 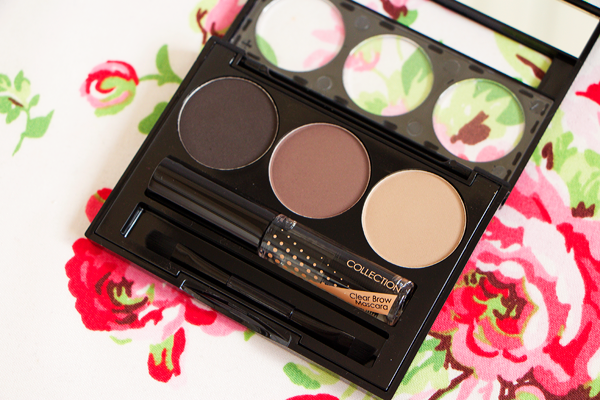 You can really sculpt your brows with this, creating a clean but bold look. 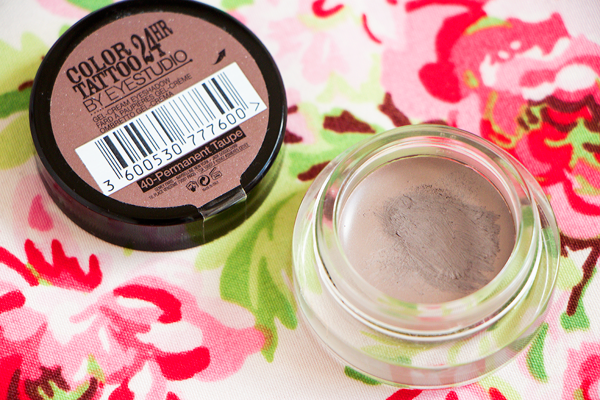 The taupe colour is buildable & would work well for anyone with cool-toned medium or dark brown eyebrows. 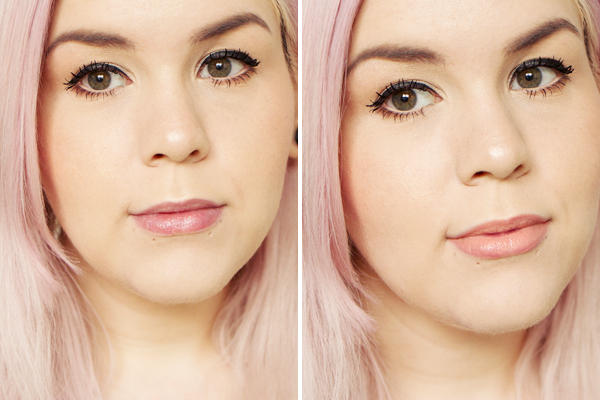 What's your favourite budget brow product? Anyone else unashamedly obsessed with Taylor Swift's new song? I haven't been able to stop singing it all day long! If only I looked as cute as she does in the video. I wore this outfit yesterday as the weather was finally warm enough for shorts again. I bought these high-waisted ones from American Apparel last month. Their shorts always seem to fit me a lot better than ones from other stores. They're really expensive for what they are but luckily I had a 30% discount code. I also got their watermelon shorts as I just couldn't resist! 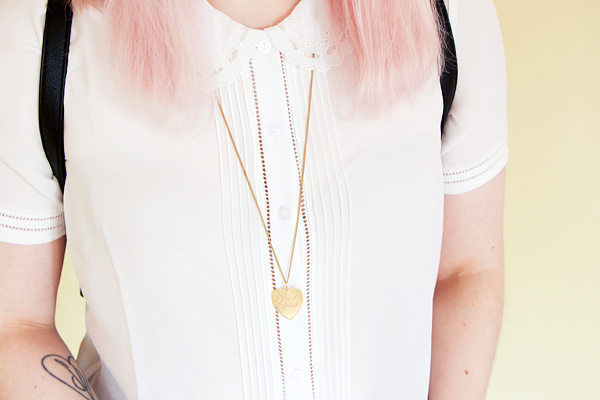 I paired them with this lovely lace collar blouse from Cooperative at Urban Outfitters. 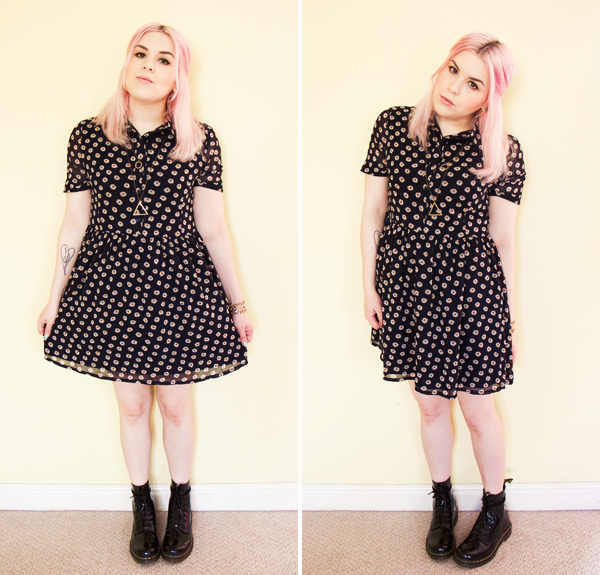 Cooperative are probably my favourite UO exclusive brand, I basically want everything they make! I'm trying to make the most of my JuJu Jellies before I inevitably have to retire them for the coming seasons. It doesn't matter how many Jesus sandals comments I get, I still love how they look with frilly socks. 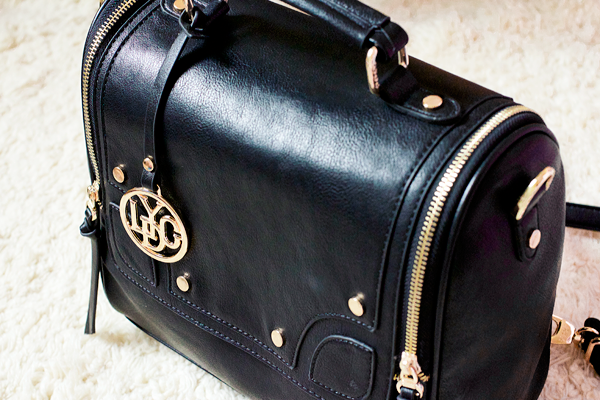 I think this would be a really sweet back to school look, especially with this amazing Holland Park backpack from LYDC. I've wanted one like this for ages! It reminds me of the ones that Japanese school kids wear, I've always thought they looked much better than the slouchy kind. It's such a great size, I've been using mine to carry about all my camera equipment. Everything fits in there easily & feels very secure. 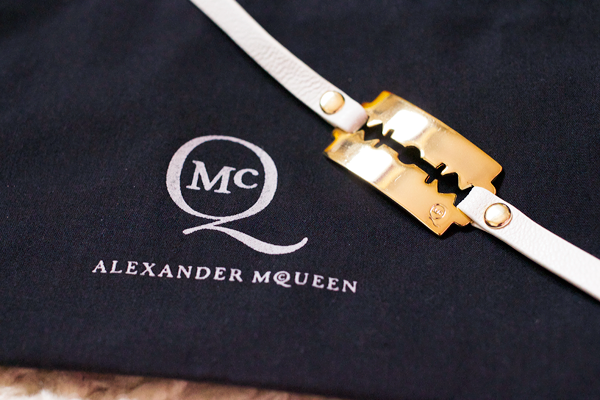 I'm also absolutely loving this gorgeous Alexander McQueen leather wrap bracelet from Harvey Nichols. I can't get enough of gold hardware & this is such a cool piece of jewellery. 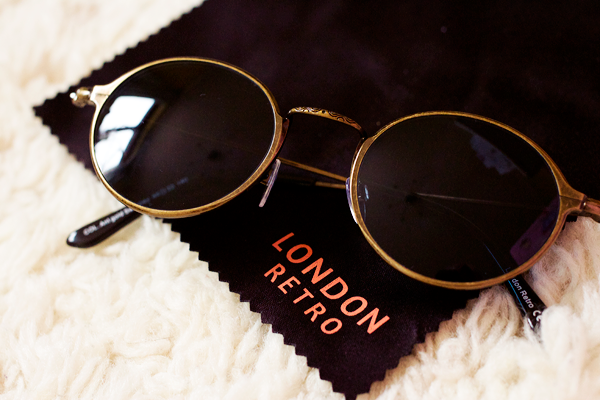 It encompasses McQueen's rebellious attitude & adds a tough-luxe accent to my outfit. 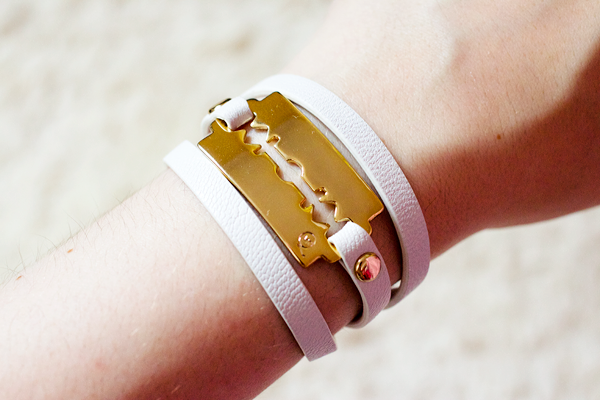 I normally go for black & gold together so the white leather makes a nice change for me. My number one criteria for bath products is that they have to smell exceptionally good. One brand that I always come back to is Organic Surge. As a lover of fresh citrus scents their Citrus Mint shower gel is utter perfection to me. It was the first Organic Surge product that I ever tried & it's something that I have repurchased many times since. More recently I noticed that their Fresh Ocean shower gel also features lots of lovely natural citrus oils & had to give it a go. Citrus Mint smells more like lemons & oranges whereas Fresh Ocean is very limey. The scent is quite masculine in comparison & reminds me of sherbet. It combines pure lemon, rosemary & lime essential oils which are very stimulating & invigorating. There's a little bit of peppermint oil in there too which contributes to it's cooling properties. 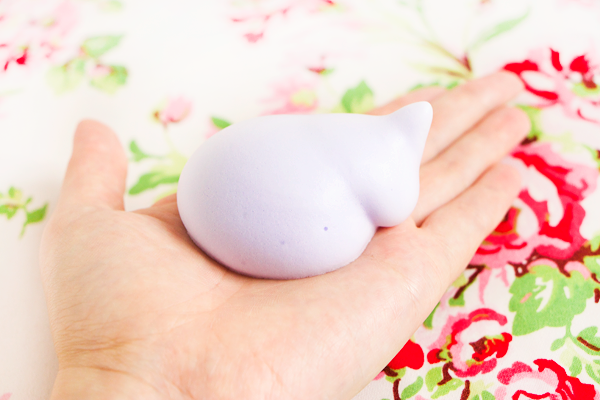 It gently cleanses & revives the skin, making it feel tingly fresh. This shower gel always manages to perk me up in the morning. There's nothing better than breathing in all those gorgeous organic essential oils. The scent doesn’t last on my skin but it makes my bathroom smell amazing for ages. 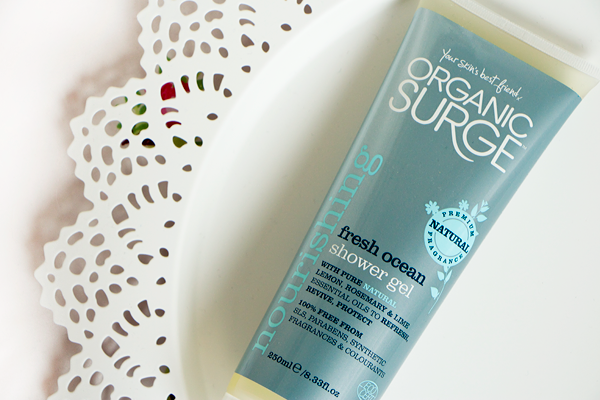 Fresh Ocean is an ideal scent for Summer. Personally I prefer their Citrus Mint shower gel as it's a bit more zesty but this one does smell wonderful too. Organic Surge's bath products always smell much more expensive than they really are. Not only do Organic Surge's shower products smell absolutely incredible, they're kind to sensitive skin as well. This particular shower gel is 98.9% natural. All of their products are free from harsh chemicals, SLS, parabens, synthetic colours & perfumes. My eczema-prone skin reacts a lot better to products that don't include those ingredients. This shower gel feels quite moisturising as it contains sunflower seed oil & natural glycerine to nourish and protect the skin. It is also enriched with aloe vera which helps to soothe any irritation. This product lathers up really well despite a lack of SLS. Your skin will be left feeling perfectly clean without stripping it of it's natural oils. If you find that most shower gels irritate your skin then I would highly suggest switching to something a bit more natural & organic like this one. That luscious fresh scent will certainly set you up for the day ahead without drying out sensitive skin. 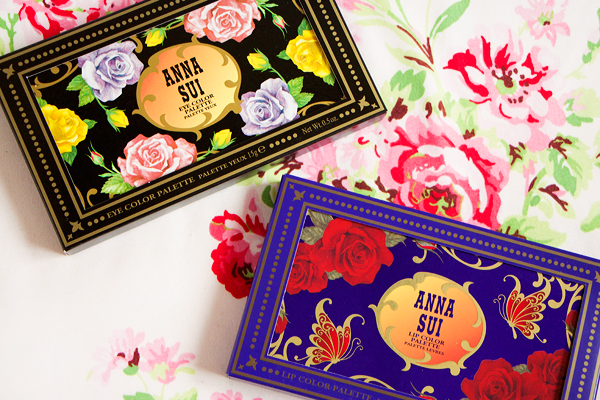 More than 15 years since it's initial launch, Anna Sui's beauty collection finally reached our shores at the end of last year. Just like her fragrances, the cosmetics line is well known for it's quirky yet beautiful packaging. Anna Sui's iconic Dolly Girl was one of the first 'proper' perfumes that I ever purchased. It's sweet floral scent quickly won over my teenage self. 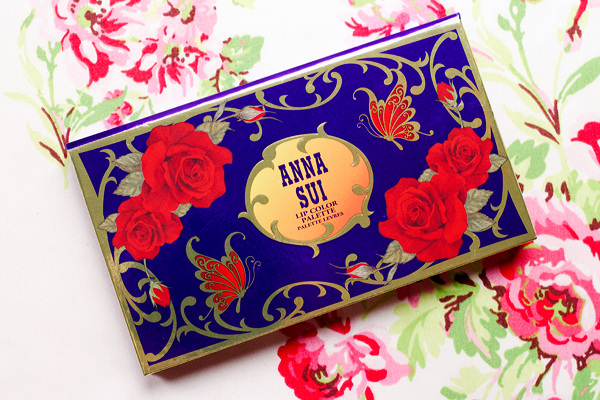 Being a longterm Anna Sui fan I've been eager to try some of her makeup products. I was recently sent a couple of palettes from her latest collection & I've really been enjoying using them. The range of colours present is rather unique which definitely increases their appeal. Both of these palettes normally retail for £28 each but Escentual currently have them on offer for just £14! 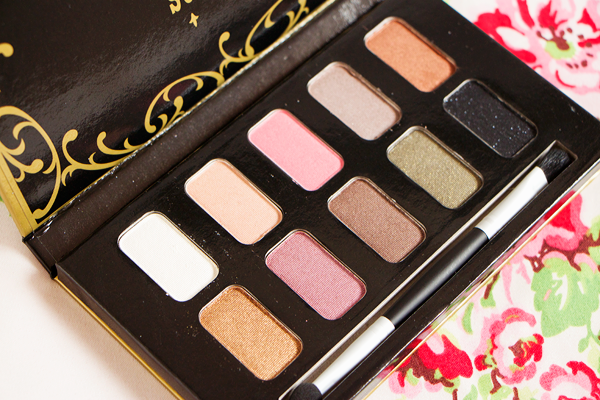 In a world of neutral eyeshadow palettes the Anna Sui Eye Color Palette* is a breath of fresh air. The palette has a good balance of light & dark shades. The vast majority are very pigmented & smooth. 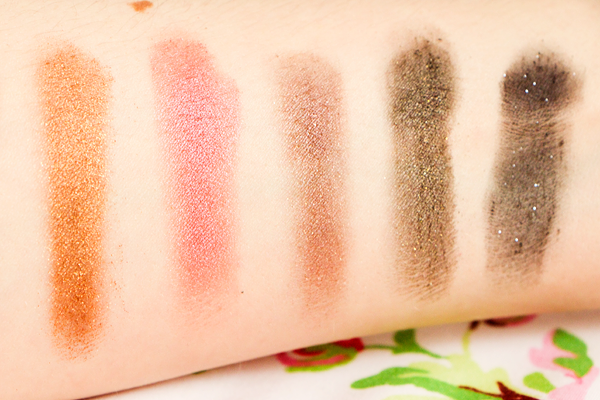 The first seven pans have a particularly nice velvety texture. I noticed a lot of fallout with the darker colours so pop a tissue under your eye before applying them. They also feel quite gritty. I wish the black didn't have those chunky glitter particles & was a soft matte shadow instead. I think the colours in this palette are quite Autumnal so it'd be a worthy investment for the coming months. I adore the shimmery golds & pinks which add a touch of romance to any makeup look. 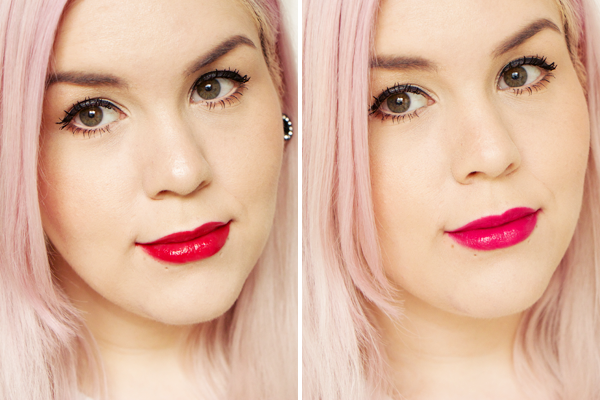 I used the four shades in the left hand corner in my photos & I think they all look really pretty. I applied the dark pink shade all over the lid and blended the golden bronze shadow into the crease & underneath my eyes. 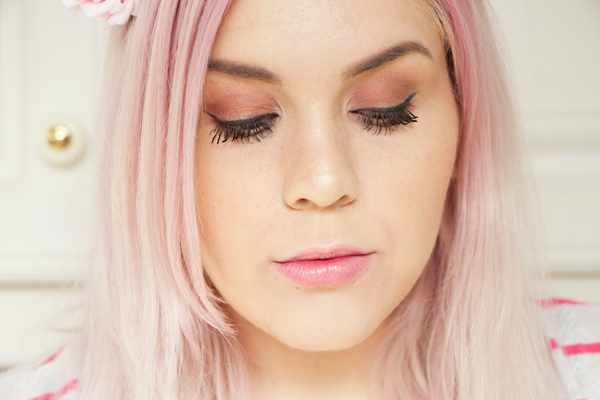 Then I used the white to highlight my tear duct & the shimmery peach underneath my brow bone. 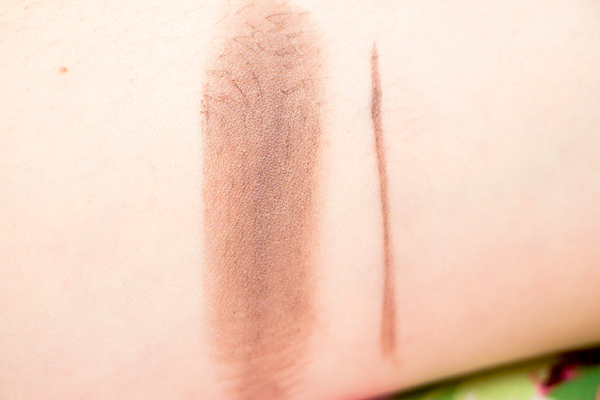 The result is a warm & girly smokey eye. 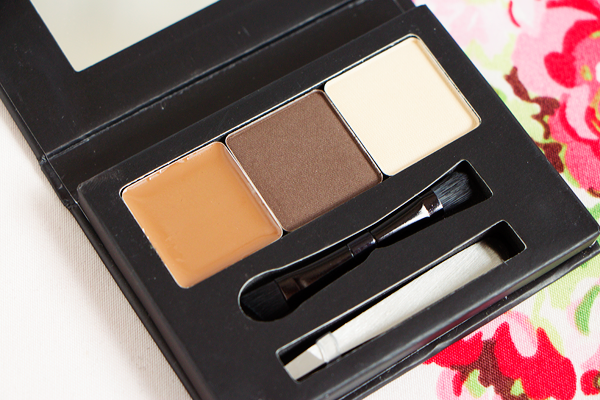 The whole palette is very versatile & can be easily utilised for any number of makeup looks. The eyeshadow pans contain 1.5g of product so considering you're paying £1.40 for each one, this palette is really great value for money. 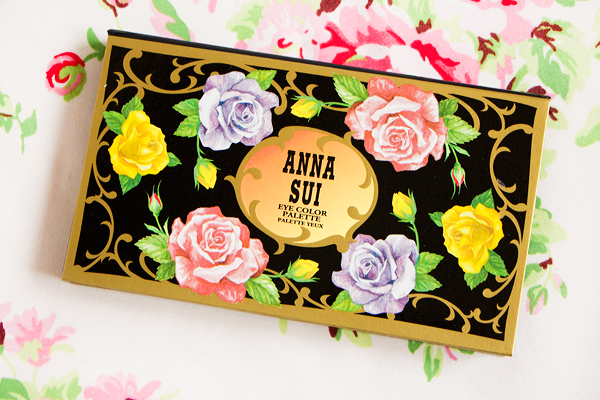 The Anna Sui Lip Color Palette* features 10 glossy lipsticks. 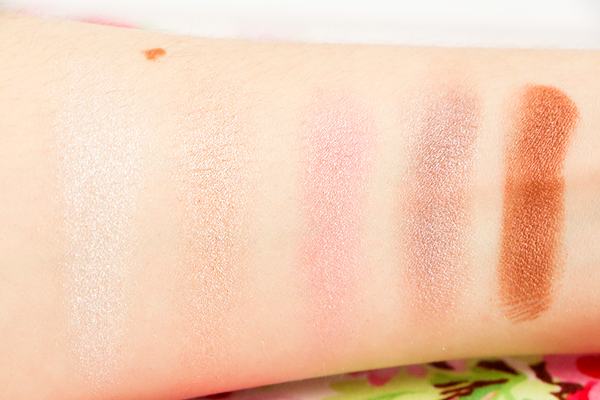 Much like the eyeshadow palette, the pigmentation varies on some of the shades but overall the quality is excellent. Most of them are opaque in one swipe. 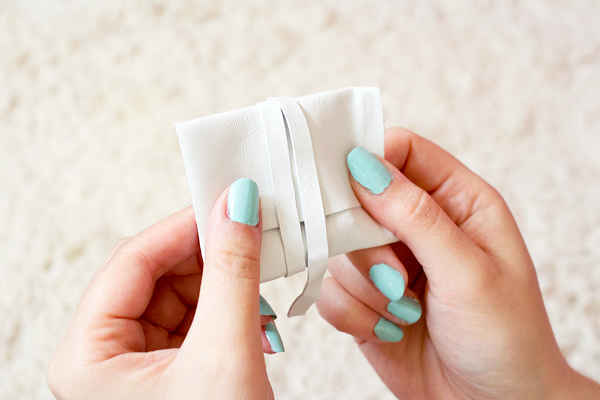 They feel really silky on the lips & are comfortable to wear. The texture is quite balmy so they feel very creamy & hydrating. They also have a lovely subtle rose scent! 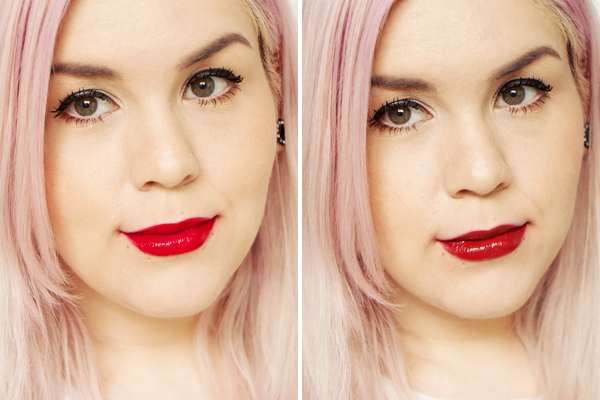 Each lip colour lasts a good few hours on me but their glossy nature means that you will need to reapply them. They fade evenly & some of the brighter colours leave a pretty stain. There's such a fab range of colours here. Peaches, pinks, corals & reds - this palette has them all. The white shimmer is meant to be used with one of the other colours to add dimension but it looks okay as a glittery lip balm too. I don't think the peachy shades really suit me but otherwise I'll get a lot of use out of this palette. My favourite colour has to be the fourth one along the top row. It's a bright punchy coral that instantly lifts my complexion. I actually really like the last one as well, it's a nice vampy & glossy burgundy that would look totally badass on a night out. 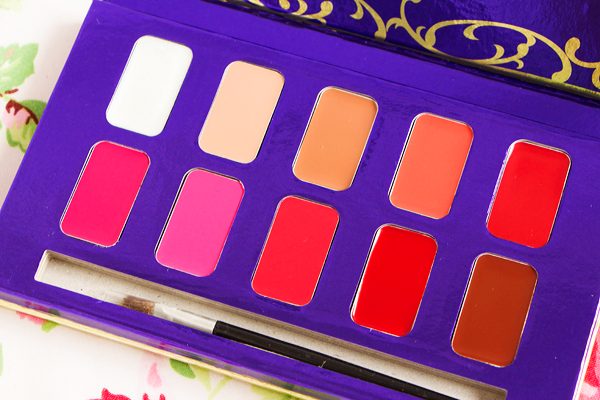 You can mix & match any of the colours to create your own custom lipstick which makes this palette even more awesome. The lip brush included isn't great but that doesn't devalue the palette at all. I apply them using the Real Techniques Retractable Lip Brush which works brilliantly. It allows you to shape your lips well & the lid makes it perfect for your handbag - totally essential if you want to top these up on the go. 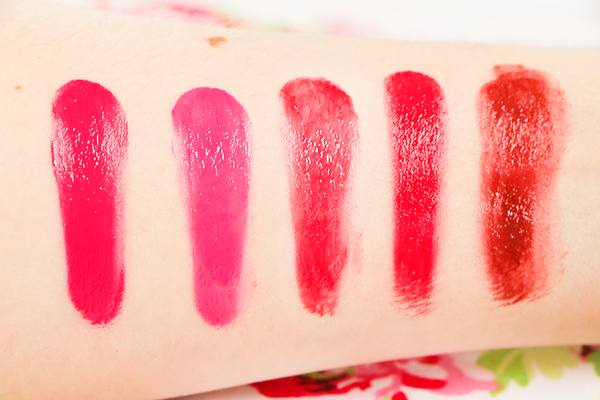 If you don't fancy using a lip brush then these also look nice as lip stains by softly dabbing them onto your lips. Minus the first three shades I think this palette is utterly fantastic. I only wish it came with a mirror in the top! I am so impressed with both of these palettes! There's something here to suit every occasion. They would make such lovely gifts for anyone. 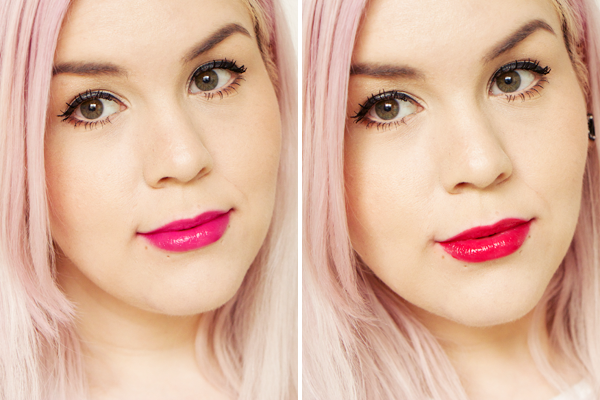 The lip palette is definitely my favourite of the two. 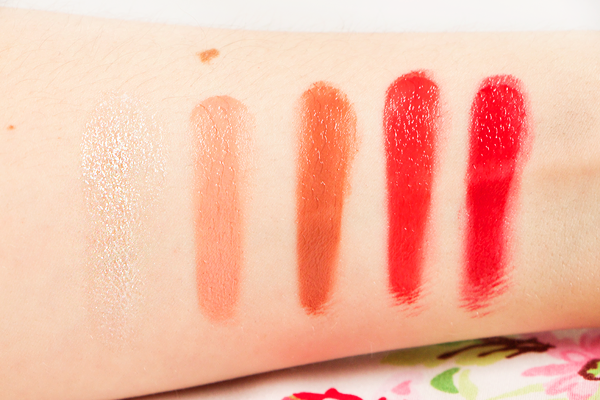 It's incredibly versatile & features so many gorgeous colours. I love the floral packaging which is made from light yet sturdy cardboard. They feel like quality palettes but they won't weigh down your makeup bag. These palettes are limited edition so if you like the look of them I'd suggest snapping them up quick! At just £14 each you won't find a better beauty bargain anytime soon. Although I'm no stranger to dyeing my hair unnatural colours, most of the time I prefer to keep my blonde locks looking as clean & white as possible. I always get my hair bleached & toned at a professional salon. My natural colour is a very dark ash brown so it requires a lot of skill, time & effort to lift it to my desired level of platinum blonde. If you're considering going for a drastic colour change like mine then I would definitely recommend going to a salon as too many things can go wrong. Whenever I get my hair toned they always use a L'Oréal Professionnel Luocolor toner in either P01 or P02. P01 is slightly bluer and P02 is slightly pinker in tone. They both help to further lift the colour & make everything look more even. They also give the hair a lovely pearlescent multi-dimensional finish which makes it look shinier & healthier. A few weeks after my hair appointment I start to notice some yellow tones creeping through my hair. A lot of things can cause brassiness including the sun, hard water & using hair products with sulfates. To help maintain my light ash blonde colour at home I use a purple shampoo & conditioner. As purple is opposite to yellow on the colour wheel, it cancels out brassy tones & refreshes the tone of your hair. I've been bleaching my hair regularly since 2006 & subsequently I've tried a lot of purple haircare products over the years. Different shampoos & conditioners contain different colour pigments which can alter the tone of your hair. 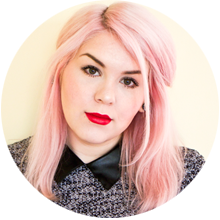 Lee Stafford's Bleach Blonde products would always turn my hair pink (his Hot Shots 4 Blondes are awesome though!) & Clairol Shimmer Lights would always turn my hair grey. It just depends on what look you're going for really. In general I prefer a pure white blonde. For a clean blonde look I would recommend Provoke Touch Of Silver Twice A Week Brightening Shampoo, Fudge Clean Blonde Violet Toning Shampoo & L'Oréal Professionnel Serie Expert Silver Shampoo. 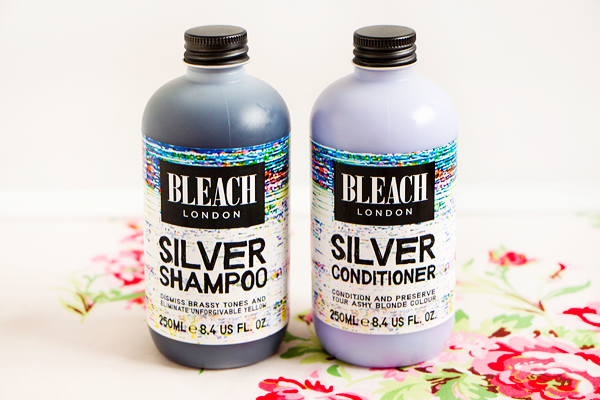 At the minute I'm using Bleach London's Silver Shampoo & Silver Conditioner. I actually think that these products are really brilliant. For just £5 you get 250ml of product and the bottles seem to last for ages. The shampoo is a very deep purple colour which knocks out yellow tones a treat. I love the bright white look it gives to my hair. It doesn't leave me with any random blue, pink or purple bits, the tone is very clean. It also contains wheat proteins & vitamin B5 to moisturise your hair. One of the things I don't like about purple shampoos is that they can often be very drying which is the total opposite of what anyone with bleached hair wants. This one is very gentle on the hair & keeps it feeling soft. When I used the purple shampoo alone I found that I needed to use it with every wash but combined with the conditioner the white tone lasts a lot longer. 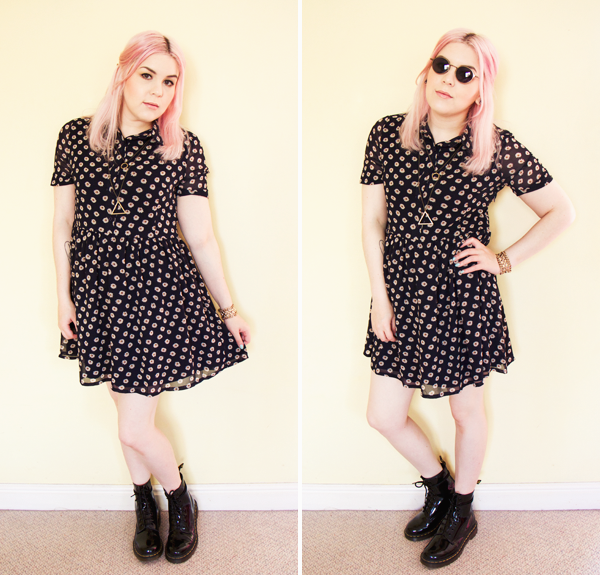 I adore Bleach London's conditioning products, they make my hair feel absolutely incredible. The silver conditioner is a thick blue-toned lilac cream. It's fantastic at both toning & hydrating. These products definitely work better when you use them together than just the shampoo alone. The one thing I don't really like about them is their scent. It's very strong & masculine and sometimes makes me sneeze. But for the price you can't really complain! Of course if you use too much purple shampoo then any of them can add unwanted pigment to your hair. To balance things out I only use toning products every other wash. Be careful not to leave them on your hair too long either. I still want to make sure there aren't any brassy tones in my hair though. 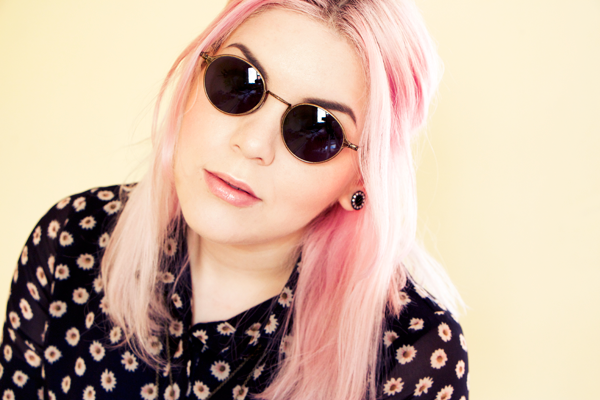 In between my washes with the Bleach London products I use a toning mousse. 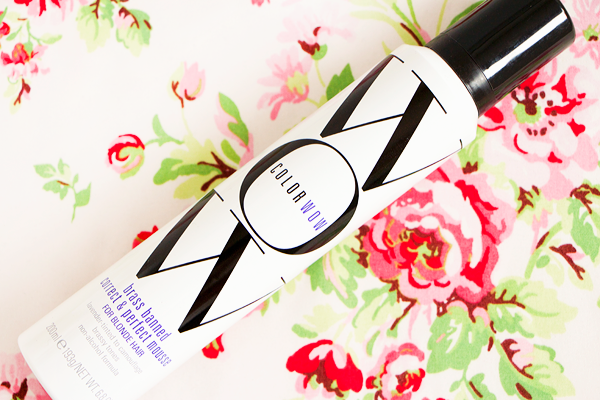 Color Wow are one of my favourite brands for hair styling products. I've been reaching for several of their products over Bumble & Bumble ones lately so that's really saying something. Their Brass Banned Mousse For Blonde Hair* is a wonderful dual-purpose product. Not only does this pretty lavender mousse counteract harsh brassy tones, it also gives your hair masses of body. It contains plasticisers for added flexibility & to eliminate stiffness, distinguishing it from other mousse formulas, which harden & stiffen the hair. It holds a style well without making your hair feel gross & crunchy. This mousse is also alcohol-free which means that it doesn't dry out bleached or highlighted hair. 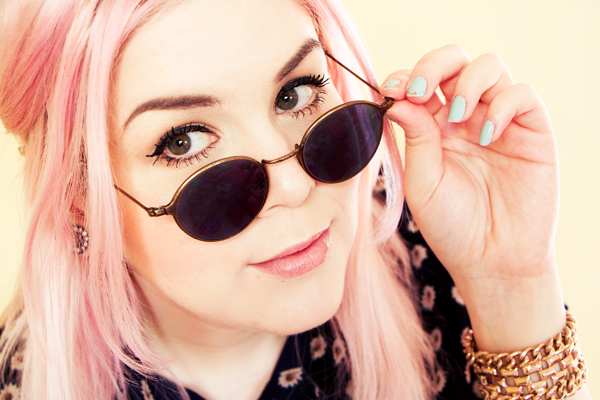 I love how bouncy this makes my hair look & it's the perfect stopgap between toning sessions. What are your favourite products for maintaining bright blonde hair? From a young age crystals have always fascinated me. There was a fantastic new age shop near my school & I used to save up my pocket money for books on crystal healing as well as crystals & gemstone jewellery. Crystals have the power to hold energies which can affect mental, physical, spiritual & emotional aspects of ourselves. By simply carrying a crystal with you I believe it is possible to heal yourself & aid any problems you are currently experiencing. It's not very practical for me to have loads of crystals in my bedroom anymore so these days I prefer to just wear gemstone jewellery. Gems & crystals aren't quite the same thing as crystals tend to be raw and gems are cut & shaped. But even a tiny piece of gemstone can carry vibrations that help bring a sense of well-being into your life. I really love the tradition of giving someone a piece of jewellery with their birthstone gem in it. This supposedly brings the wearer good luck & protection in the year ahead. I've even kept hold of some birthstone jewellery that my mum bought me when I was a child. 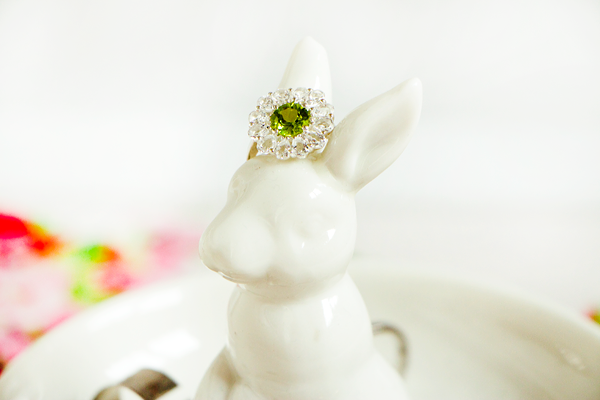 I recently had my birthday and being an August babe my birthstone is the gorgeous green Peridot. These gems emit a warm & friendly energy. Peridot stones have a high vibration so even the smallest of gems will have an energy that can easily be felt. They are associated with love, truth, faithfulness & loyalty. Peridot is considered to be effective on health problems relating to detoxification & digestion. The gem is used to enhance prosperity, fame & self-esteem. It can also alleviate stress, anger, jealousy & depression. Today the stone is cherished by people more for it's beauty than it's metaphysical properties but they still remain a great part of it's appeal. In addition to being the birthstone for August, it is associated with the star sign of Capricorn & used to celebrate the 16th wedding anniversary. As part of their Bejewelled Birthdays campaign, Gemporia kindly gifted me this absolutely stunning silver ring. It features 1.41cts of Hunan Peridot and the round gemstone is surrounded by smaller White Topaz teardrop gems. 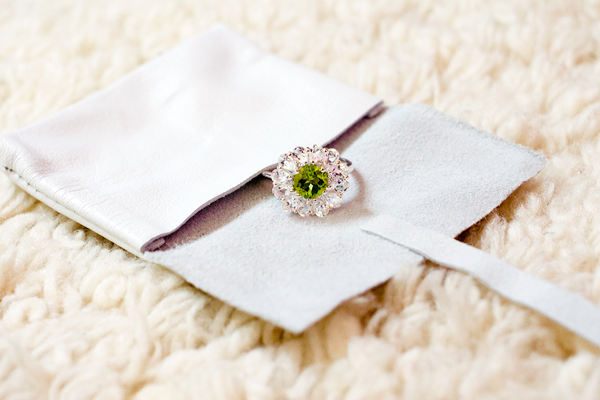 The best Peridot appears as a sparkling lime green colour & this definitely fits the bill. This ring just looks amazing & I've barely taken it off since I got it. 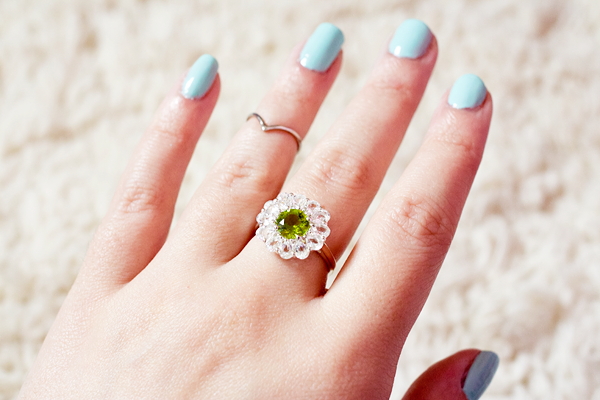 Wearing a lovely sterling silver Peridot ring like this one can increase the level of good vibrations in your life. One of the main characteristics of this green gem is it's ability to elevate your overall level of happiness. I certainly hope it helps to clear any negative emotions & bring me joy in the coming year. Jupiter is in Leo & will stay there until August 2015 so I'm sure that will help bring plenty of good fortune my way as well. Are you a fan of gemstone jewellery? Does anyone else believe in the healing powers of crystals?